Hang on to your Christmas spirit a little longer and cleanse your closet instead. If you are anything like The Lady’s Maid, the last thing you want to do in the midst of January is adopt the customary New Year post-Christmas detox, diet or that strange phenomenon of recent years: “dry January” (why make the bleakest month of the year any worse by depriving yourself of a warming tipple). As the first month of the year, it is natural that the arrival of January prompts people to assess their lifestyles and want to improve, in an effort to “start as you mean to go on”. Still, The Lady’s Maid prefers to bask in the glory of Christmas until at least Candlemas. So, instead of depriving yourself of food and drink’s winter-warming sustenance, The Lady’s Maid suggests you turn your attention to a “wardrobe detox” instead. If you have had a January Sales splurge and need to free up space for your new winter additions, then January is a perfect time to de-clutter your closet and release your inner “Marie Kondo”. Most ladies, at one time or another, have uttered the panic-stricken words “I have nothing to wear”. It is never usually true and often a result of clothing clutter – it is hard to create an outfit if you can’t easily locate one. Clearing out clothing clutter will also help you to identify what gaps you may have in your wardrobe – garments that you may need to purchase to get the full potential out of the clothes you currently have, enabling you to create outfits with ease and take the stress out of dressing. A YouGov survey in 2012 revealed that there are around 2.4 billion pieces of clothing lying unworn per year in the UK, cluttering up wardrobes across the land; this equates to approx 46% of the national wardrobe. A similar survey in 2017 by Weight Watchers estimated the figure of wasted expenditure on clothing to be £10 billion, or £200 per adult, with only 55% of the clothes women own actually being worn. Clothing clutter is clearly an ongoing problem. Whilst some people may be hanging on to things for posterity, or “just in case” they may need it/fit in to it one day, there is undoubtedly a hoarding of unworn or unnecessary clothing going on. If garments no longer fit or you haven’t worn them in a while, try selling them on eBay first or donate to a charity shop. Popular designer and high-street labels and occasion outfits/dresses tend to sell better than casual clothes on eBay, so consider sending casual clothes straight to the charity shop, if they are in good condition, or to a clothing recycling bank. High-end designer labels will also sell well on designer second-hand clothing websites, such www.hardlyeverwornit.com or http://www.cudoni.com. To keep your clothing collection at a manageable level with a wardrobe that is accessible and wearable, try to resist purchasing any unnecessary items; focus instead on filling the gaps in your wardrobe that were revealed after the clear-out. Group 2 (things that you are keeping but need to supplement with new purchases in order to wear) is likely to be full of separates which only work if they have something to work with. Make a list of things you think your existing wardrobe would benefit from and focus on acquiring these items the next time you go clothes shopping. Your goal is for a versatile and manageable wardrobe to fit in with your space and lifestyle. Resist the temptation to purchase new one-off garments unless you think they will complement what you already own. Once the detox is complete, your remaining wardrobe needs to be efficiently organised so that you can easily locate specific garments. 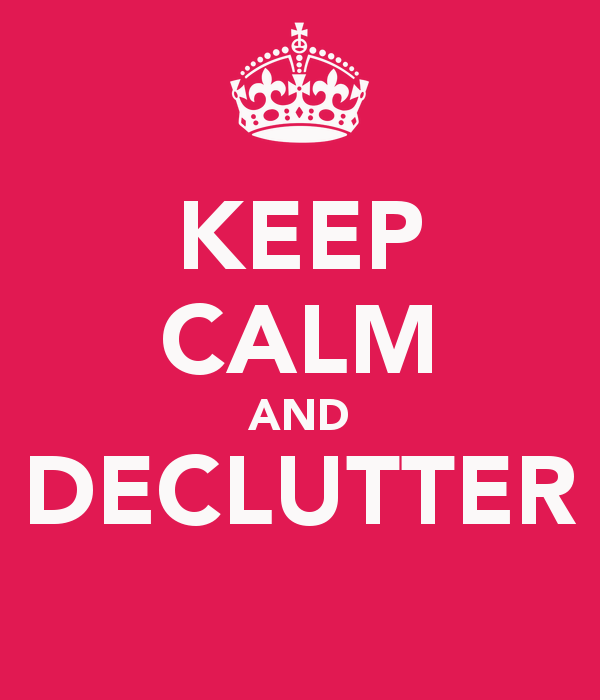 It will be much easier to avoid clutter creeping back in if everything is suitable stored. The best way to organise your clothing in your wardrobe is to divide it into sections, such as: work wear, casual wear, evening wear, sportswear. Within these sections organise garments by type (skirts/trousers/tops), and then by colour, darks to lights. If you want your wardrobe to look neat and streamlined, discard shop hangers that came with your garments as these will vary in size and add bulk to the wardrobe space. If you adopt slim velour-covered plastic hangers, or slim rubber hangers throughout the rail you will keep the clothes hanging at an even level and achieve a streamlined visual effect as well as saving space. Keep woollen knitwear folded to protect the natural fibres which will stretch if hung on a clothes hanger. Box-folding and arranging by colour is the best way of organising knitwear – keep different types together i.e. high-necks, V-necks, crew-necks etc for ease of location and then organise each type by colour, darks to lights. You can use a shirt-folding template to help achieve a uniform shape, or a plastic chopping board works just as well! Hanging shoe organisers are a great space saver for flat footwear. These can be hung over a hanging rail to allow you to store multiple pairs of shoes. You can also store other small accessories here, such as scarfs, belts and gloves. Out-of-season clothing can be stored on top of the wardrobe or under the bed, to free up space for clothing in wear during the current season. Be sure that any storage boxes and bags that you use are appropriate for clothing – they should be made of breathable cotton or canvas material, not plastic. And if woollen knitwear is present, add a lavender sachet to ward off the pesky moth. Delicate garments should be folded with acid-free tissue paper to protect them from creasing. Drawer organisers are useful for keeping different types of underwear separate, and preventing you from having a top drawer full of jumbled smalls. If you don’t have drawers, then you could arrange underwear in open shoeboxes on shelves, or in similar shaped boxes. Acrylic drawers and stackable trays are a good way of storing costume jewellery and sunglasses to protect them from dust; the transparent plastic makes it easy to view the contents. Clutter is something The Lady’s Maid tries to avoid, especially within the wardrobe. Some of the wardrobes she has worked with are so large she gets lost in them and would quite like to stumble upon a Narnia-like world to escape them. Ladies that employ a Lady’s Maid are evidently in need of someone full-time to impart some order on to the chaos that can become a woman’s wardrobe. But whatever the size of your clothing collection it is still important to adopt a little organisation and appropriate decision-making to get the best out of it. A YouGov survey in 2012, commissioned by M&S revealed that there are around 2.4 billion pieces of clothing lying unworn per year in the UK, cluttering up wardrobes across the land; this equates to approx 46% of the national wardrobe. A similar survey by Weight Watchers, reported in January 2018, estimated the figure of wasted expenditure on clothing to be £10 billion, or £200 per adult, with only 55% of the clothes women own actually being worn. Clothing clutter is clearly an ongoing problem. Whilst some people may be hanging on to things for posterity, or “just in case” they need it, there is undoubtedly an accumulation and hoarding of unwanted or unnecessary clothing going on. The often heard sartorial refrain: “I have nothing to wear” is often due to clothing clutter – it is hard to create an outfit if you can’t easily locate one. The Lady’s Maid advises performing a wardrobe detox at least twice a year to prevent overcrowding the closet. So, before you begin organising your winter wardrobe, try and have a clearout to eliminate old clothing that is no longer worn. This process is so important, especially if you regularly buy new clothing, as it will free up space for the remaining clothes and new ones, enabling you to organise them better and find specific items easily. It will also help you to identify what gaps you may have in your wardrobe – garments that you may need to purchase to get the full potential out of what you currently have. Having a thorough wardrobe audit is also very liberating – it will make you feel much more organised and in control of your clothes and your style. The ends of seasons are the best times to have a clearout, so you can do it at the same time as rotating your wardrobe and putting out-of-season-clothes into storage (see post on seasonal storage for tips on storing clothes). If there are any garments that are dirty or damaged or need altering deal with them before returning to the wardrobe or selling/donating to charity. If they need repairing/altering you aren’t going to wear them until they’re fixed – nothing should be in the wardrobe that isn’t ready to wear. To keep your clothing collection at a manageable level, try to resist purchasing any unnecessary items and focus instead on filling the gaps in your wardrobe that were revealed after the clear-out – Group 2 is likely to be full of separates which only work if they have something to work with. Make a list of things you think your existing wardrobe would benefit from and focus on acquiring these items the next time you go clothes shopping. Your goal is for a complete, versatile and manageable wardrobe to fit in with your space and lifestyle. Resist the temptation to purchase new one-off garments unless you think they will complement what you already own. Another way of keeping control of your new tidy wardrobe is to always get rid of something old every time you buy something new. Unless you have unlimited space this is the only way that you will keep the size of your wardrobe at a constant level and prevent overcrowding. By selling old items on eBay this will also make you feel more justified in making a new purchase as you have given yourself a discount tag! Once the detox is complete your remaining wardrobe needs to be efficiently organised so that you can easily locate specific garments. Avoiding clutter creeping back in will be much easier if you have appropriate wardrobe space and storage solutions, so in the next post The Lady’s Maid will look at wardrobe organisation.